This Belgian made waffle maker has been a European favorite for over 50 years. It is a very versatile addition to any kitchen. The back and forth rotating feature ensures that the batter is evenly distributed and the results will be uniform. The temperature gauge on the top of the machine allows for experimentation with texture so you can create a light, airy waffle or a crispy, crunchy one, whichever you prefer. 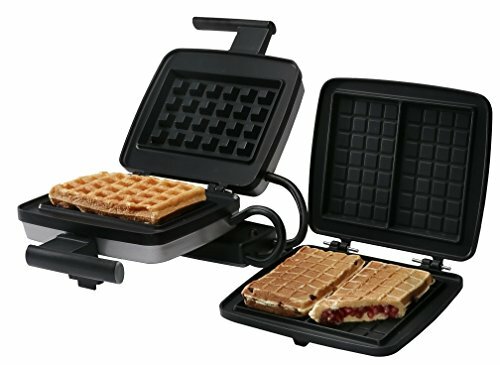 A very special, unique feature of this waffle maker is that the waffle plates are easily interchangeable with a variety of 8 different types of waffle plates, each with its own distinct shape and function. These additional plates include a traditional American waffle plate, a heart shaped waffle plate, an ice cream waffle cone plate, a Croque Monsieur and more. This waffle maker will come with the Belgium waffle plate installed along with a stuffed waffle plate. Each dishwasher safe cast aluminum plate is produced with a non-stick coating that allows for the waffle to be removed effortlessly.